The Purple Aces have assembled a talented group of coaches and a collection of some of the most respected basketball minds in the state. These coaches volunteer their time and talent with the focus of developing great players and people. Mark Demerath's love of basketball began as a player for Seymour High School. As he moved to Ashwaubenon and had children, he passed on that enthusiasm for the sport and found his new passion for coaching. Former Ashwaubenon High School Girls' Varsity Basketball coach Jim Zawlocki and Mark decided to start a girls' youth basketball program in Ashwaubenon, which still continues today. Mark helped coach Ashwaubenon basketball at various levels for over 15 years, even receiving a School Bell Award for his recognition of service to the Ashwaubenon School District in 1998. He also was part of the coaching staff that led the De Pere Redbirds to the 2005 WIAA Division I State Championship. 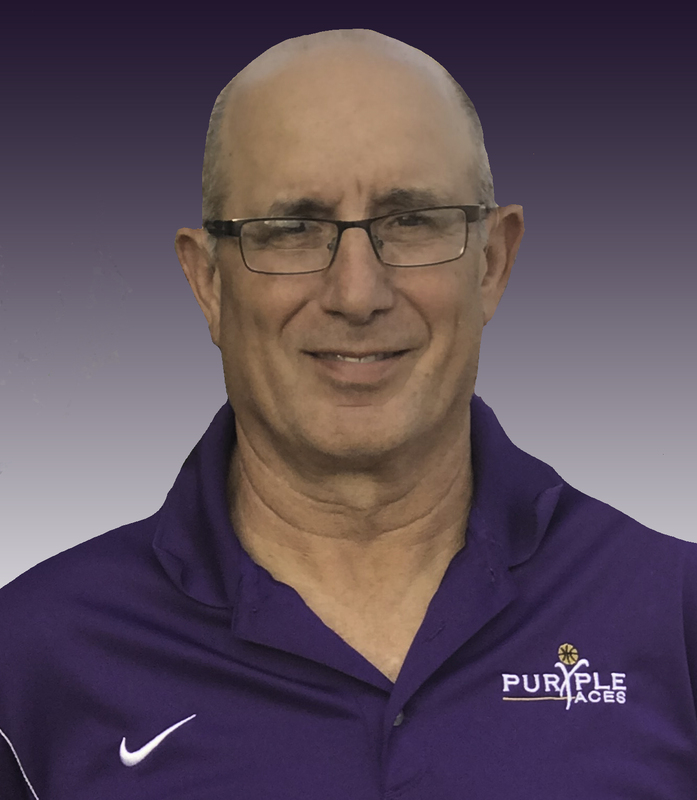 Mark began coaching Purple Aces in 1994 with his daughter's eighth grade team and hasn't stopped coaching Aces since. He has expanded Purple Aces to include fifth grade through junior level teams. Coach Demerath encourages his athletes to push themselves to their full potential. His "old school" coaching style has gained him recognition by college coaches at the Nike Tournament for producing well-rounded players that take the basic fundamentals of basketball to the next level. He treats his players like family, attending their school sporting events and encouraging them to have great character on and off the court. Mark has inspired many players to follow their collegiate dreams. Coach Demerath's unique style has not only elevated the skills of his players, but has given the girls access to experiences, friendships, and memories that will last for a lifetime. 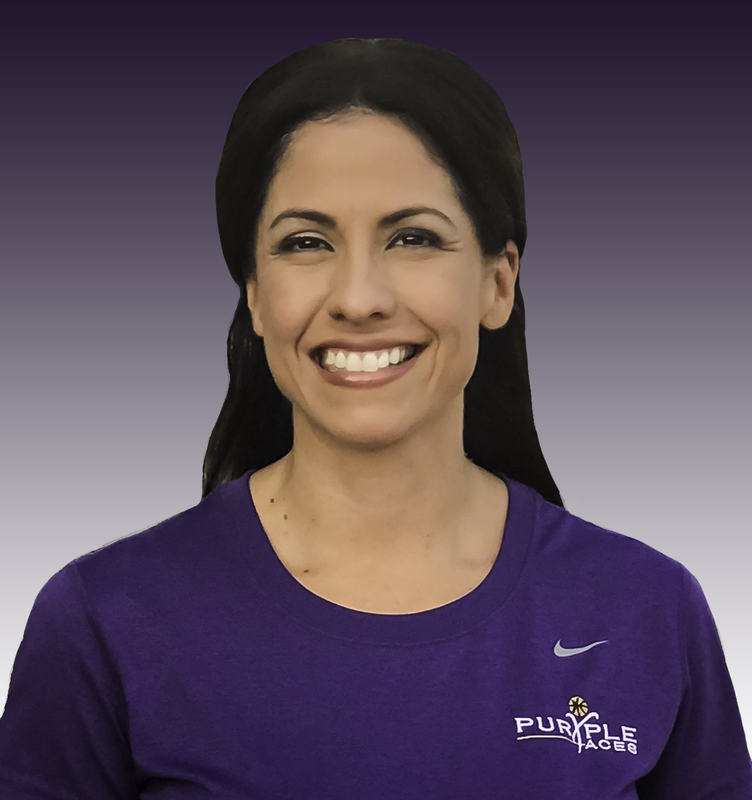 Cordero joined the Purple Aces family in the 2012 season as an Assistant Coach. Cordero has brought a tremendous amount of talent, energy, knowledge, and passion for the game of basketball to the Aces program. Born and raised in Racine, Wisconsin, he played high school basketball at Racine St. Catherine's under legendary coach Bob Letsch and was a key contributor in leading them to the WIAA 2005 Division II State Championship as a Senior. For his efforts, Coach Barkley was named Second Team All-State, Second team All-Area by the Milwaukee Journal, and was voted Racine County and Lakeshore Conference Player of the Year. He was also a State Qualifier in the High Jump. Cordero was recruited by and played basketball for Tod Kowalczyk at UW-Green Bay, where he has many fond memories on the court as a Phoenix. Off the court, he was one of only 1,840 nominees from 462 schools to be selected by the NCAA Leadership Development Committee to represent UWGB at the 2008 NCAA National Student Athlete Development Conference. Today Coach Barkley works in the banking industry, and spends much of his time working with area basketball players to improve their skills. Cordero also provides color commentary for the UWGB Phoenix Men's and Women’s Basketball home games on ESPN3 and Spectrum Sports. 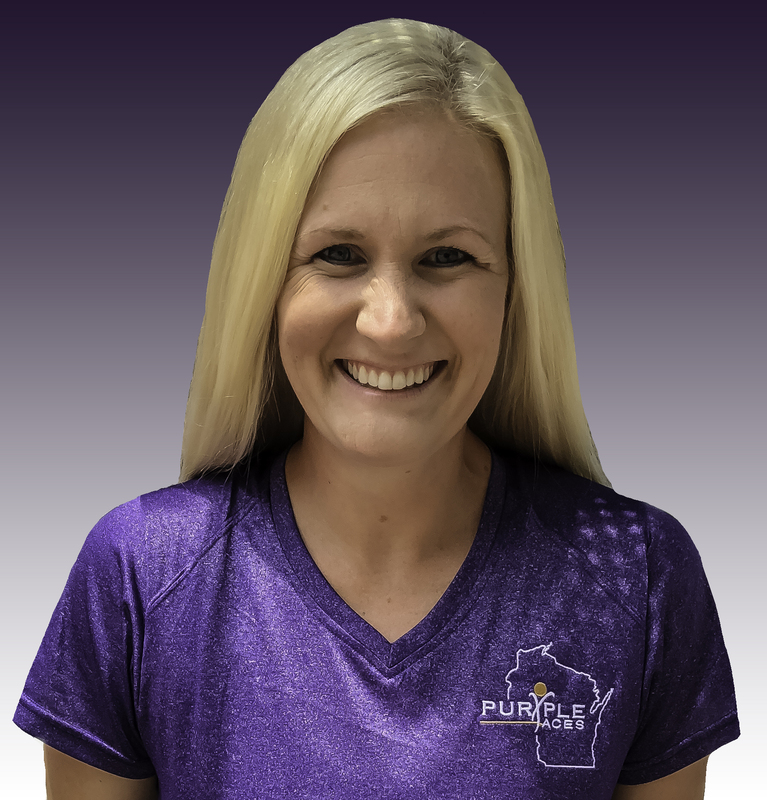 Erin joined the Purple Aces coaching staff in 2011. She has coached various high school level teams since joining us and plays a vital role in our player development. Erin is in her first year has the Head Coach of the Southwest High School’s girls basketball team. Prior to that she was an assistant coach at Notre Dame Academy in Green Bay and has helped lead the Tritons to back-to-back WIAA State Championships in 2013 & 2014. Erin played high school basketball at Richland Center, where during her senior season in 2004, she averaged 13.5 points, 7.4 rebounds and 3.6 assists per game enroute to guiding her Hornets team to the WIAA 2004 Division II State Final. For her efforts, Erin was named Wisconsin State Journal Player of the Year. She was also a three-time Conference MVP and member of four consecutive Conference Championships for Richland Center. Following her very successful high school career, Erin played collegiately at UW-Green Bay beginning in 2005 under Coach Kevin Borseth. Of her many athletic accomplishments, Erin is especially proud of being named to the Horizon League Academic Honor Roll for each of her four years at UWGB. While at GB, Erin was best known for her strong defense, unselfish play, and relentless work ethic. Among her many honors and awards are: 2007 UWGB "Most Improved Player"; 2009 Div. I-AAA Athletic Director's Assoc. Scholar Athlete; 2009 "JoAnne Jennings Award" recipient. Erin brings her knowledge of and enthusiasm for the game to the Aces family and looks forward to working with all of her players to help them achieve their dreams. Ted Stefaniak is back for his 11th season with the Purple Aces. He coached our Class of 2017 team and helped 11 of players find a college to attend and continue their basketball careers. He was also the Head Coach for our Class of 2019 which also has several college bound athletes. 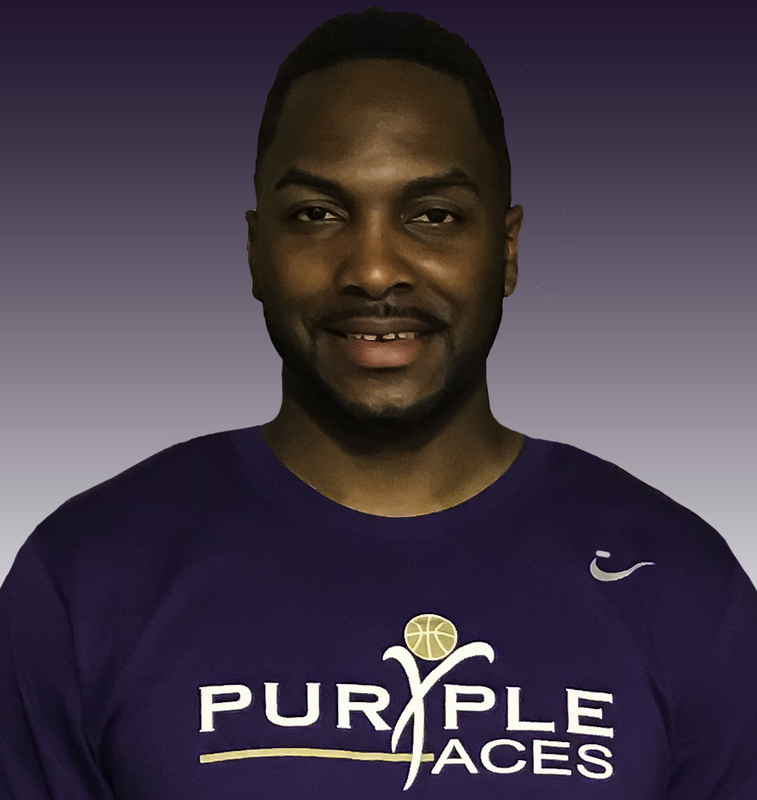 Ted joined Purple Aces in 2009 and has led teams at both the grade school and high school levels. He is a former assistant coach at West De Pere High School, but you may have seen him around your gym with a camera crew. He has been broadcasting high school and college sporting events since the early 90's and was the play-by-play announcer at the WIAA State Basketball Tournaments for 15 seasons. Ted currently provides play-by-play for the Wisconsin Herd of the NBA G-League and also announces UW-Green Bay Phoenix men's and women's basketball games on ESPN3. Ted played high school ball at Carmel Catholic in Mundelein, Illinois. He was recruited by Basketball Hall of Famer Willis Reed and played at Creighton University in Omaha, Nebraska. His passion is basketball player development and helping student-athletes pursue an opportunity to play at the collegiate level. 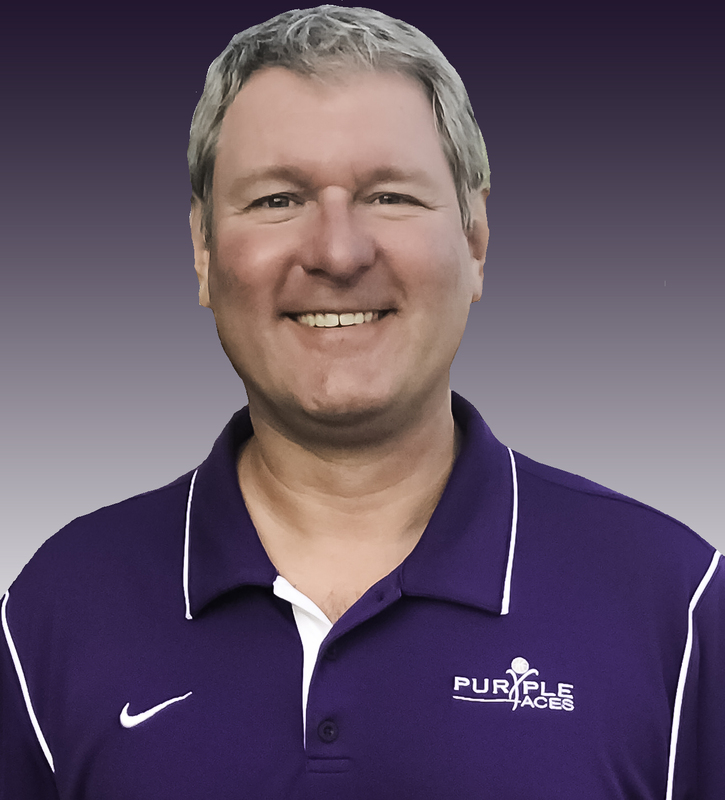 Jim joined the Purple Aces coaching staff in 2015. He played collegiate basketball and also obtained his education degree with a coaching minor at Concordia University Mequon. Jim was a head girls basketball coach for 12 years, winning two FRCC Conference Championships and five straight Regional Championships within that time period. He has also had the honor of being named FRCC Coach of the Year 2010-2011. 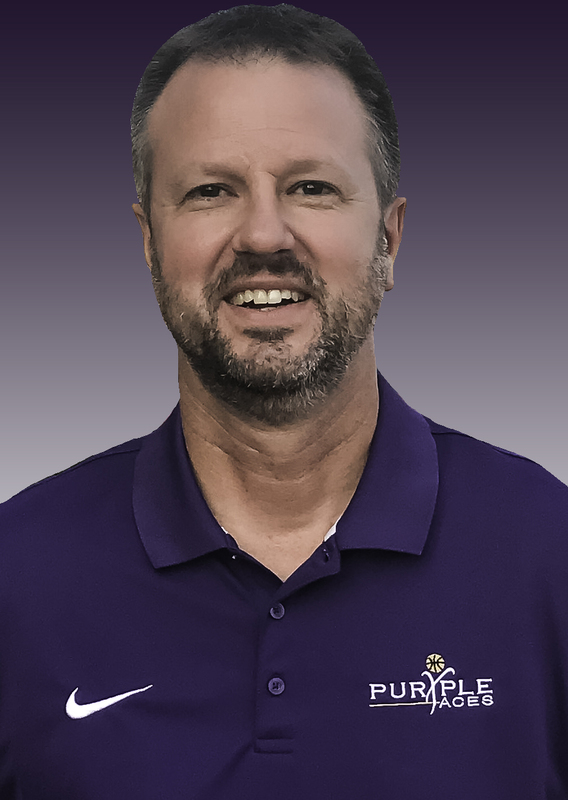 Jim has many years of experience being a shooting coach and organizing and leading small group workouts, all of which have prepared numerous athletes to be successful at the next level. He has a passion for teaching the fundamentals of the game and thrives on seeing growth in his players. 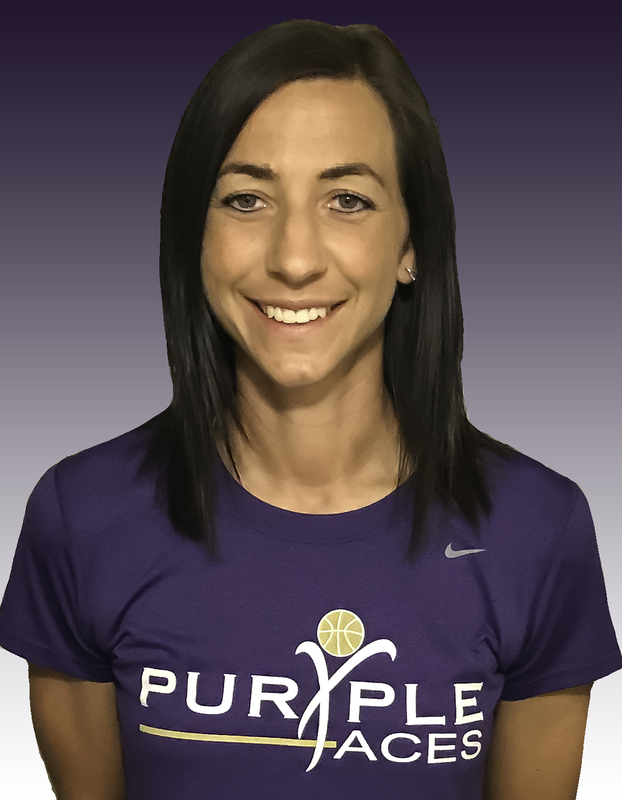 Liz joined the Purple Aces coaching staff in 2016. She played high school basketball at Boardman High in Ohio, where she grew up. Following high school, Liz played collegiately at Youngstown State University. Grzesk, a guard from 1993-1997, finished her career with 1,468 points. She earned all-conference honors 3 out of her 4 years. During her senior year, she was Player of Year in the conference and earned YSU Female Student Athlete of the year. Following her playing career, Liz was an assistant coach at Youngstown State from 1998-2002. She then joined Kevin Borseth’s staff at UW-Green Bay from 2002-2004. Today, Liz works at Lamar Advertising and volunteers her time to coach the Notre Dame Future Triton team. 2019 will be Amie's second season on the Purple Aces coaching staff. She attended Appleton East High School where she was 1st Team All-Conference in basketball, volleyball and softball. Amie went on to play basketball at the collegiate level for the University of WI - Stevens Point where she was a 4-year starter and 3-year Team Captain. She also helped the Pointers win the 2002 NCAA Division III National Championship. Amie obtained a Health Promotion/Wellness degree and has been working in the fitness industry ever since. She volunteers her time as a coach in the West De Pere Fast Break program. Amie is excited for the opportunity to be a part of the Purple Aces program. She is looking forward to working with her players to further develop their basketball skills and helping the girls understand the importance of dedication, working together as a team and positive mindset. Lavesa makes her Purple Aces coaching debut with our 8th grade team in 2019. Glover currently is an Assistant Coach at Green Bay Southwest HS, and has coached various high school level teams before joining the Purple Aces. Glover also has experience at the collegiate level including stints at Southeast Missouri State University, Valley City State University, LSU-Eunice and UW-Milwaukee. Prior to the Purple Aces she was the Head Coach at Orono High School in Long Lake,MN where she helped lead the Spartans to the MSHSL 3A State Championship in 2016-17. Lavesa played high school basketball at Dade Christian School (Miami Lakes, FL) where her #34 jersey is retired. During her senior season, Lavesa averaged 22.0 points, 18.4 rebounds and 3.6 blocks per game while guiding her Crusaders team to the FHSAA 2004 Division II State Championship game. During her High School career, Lavesa was a 3-time All-State selection, was the 3A-1A Dade County Player of the Year and also played against WNBA players Sylvia Fowles (MN Lynx) and Erlana Larkin (MN Lynx). Lavesa was a two-year starter and four-year letterwinner at UW-Green Bay from 2005-09, playing alongside Purple Aces coach Erin Barkley. She was an all-league second-team performer as a junior and was selected to the first team as a senior. In her career she scored 1,054 points and pulled down 447 rebounds while shooting 51 percent in 122 career games for Green Bay, leading the team in scoring as a senior. After graduating, she played professionally, spending time with teams in Finland, Poland and Australia. Lavesa loves the game of basketball and is extremely dedicated to the development of her players on a holistic level while ensuring that they continue to LOVE the game! Lavesa currently works for the Green Bay Area Public School District.